This function provides you with a wealth of customer service information available by using Function Keys. For maximum benefit, the users should thoroughly familiarize themselves with the many item inquiry options. These features are also available in our Sales Desk program. 1. Item inquiries listing one or all locations where an item is stocked. Also included in the item inquiry are stocking totals and Bin numbers. Being able to view stock status by all locations is extremely useful when you ship from different locations or have the need to transfer from one location to another. It is also helpful when you have multi locations within your warehouse, (refurbished items, returned goods for resale, factory seconds, inspection, quarantine, etc. ), to view stock status totals for that item. 2. Ability to use wildcards to specify the locations you wish to see stock statuses for. 3. The option to enter a caller’s name. This helps the user in remembering who they are talking to, as well as, logging the persons name for future reference. 4. After you have entered the customer’s number for an inquiry, and if no caller name was entered, then the caller name will be automatically filled with this customer’s contact name. a. View customer price breaks for this customer and item. b. Create a quote from the customer’s inquiry. 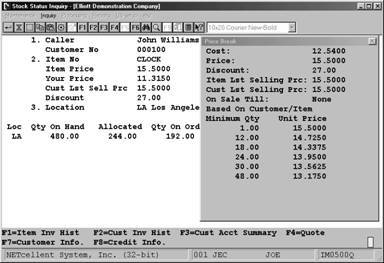 c. Create a sales order from the quote. b. View general customer information for the customer. c. View credit & YTD information for the customer. 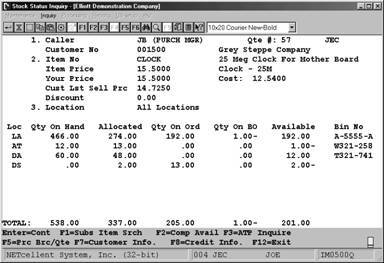 e. Perform a Component Available Inquiry to show the stock statuses of all components for a parent item to determine the quantity of the parent that can be built. f. Perform an Available To Promise Inquiry to display a listing of future quantity available, (by date), for the inventory item being viewed. Select Stock Status from the pull down COP Inquiry window. For additional views, see Global Setup Stock Status Inquiry documentation at the end of this manual. The caller name is optional. It is intended to help you remember whom you are talking with. If you leave this field blank then it will automatically be filled with the contact name of the customer you choose at the Customer No. prompt. This field is mandatory. You can manually enter the customer number or press [F7] to search by customer number or [F8] to search by customer name. If you are calling up a previous quote, you can use the F2 key to search for it or the F3 key to enter the quote number. This field is mandatory. You can manually enter the item number or press [F7] to search by item number or [F8] to search by item description. Enter the location or leave this field blank for all locations. For a specific group of locations stocking the item, enter a character and an *, i.e., L* will find all locations starting with the letter “L” such as L1, L2, L3, etc. A wildcard (*) will only work as the 2nd character, “*L” is invalid and will return the message: Location Not Found. After completing your entry of Customer No., Item no., and Location, the screen below will display your inquiry information. Note the Function Keys available at lower menu bar. Stock Status Inquiry Screen for Customer 1500 for Item “CLOCK” at all locations. The field “Your Price” is populated when the customer has a set price code for this item. “Cust Last Sell Prc” is the price the customer last bought this item for. “Discount” is the discount set up in the A/R Customer Master file. This screen contains a wealth of information and the end-user should study the information to see how they can best use it to their advantage, especially for customer service. The next page details using the Function keys available in lower menu bar. F1: Substitute Item Search: Allows you to search for a Substitute Item. This a valuable tool because if you are on the telephone with a customer and you do not want to lose a sale because of price or insufficient quantity available, you can offer the customer a substitute item. F2: Component Availability Inquiry: This option is particularly useful for quickly inquiring on the availability of all items making up a parent item. By comparing the component Qty Available and the Qty per Parent, it will display the maximum quantity available to make or assemble for the Parent Item. Max. Qty Avail: 6.500 means you can immediately make or assemble this quantity for the customer’s sales order. F3 ATP Inquiry: Performs an Available To Promise Inquiry displaying a listing of future quantity available, (by date), for the inventory item being viewed. 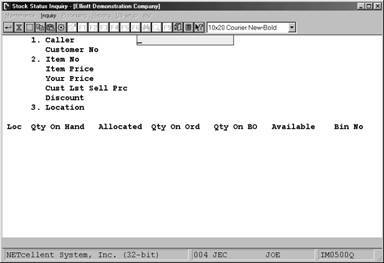 The locations and sources of quantity, (Sales Orders, Purchase Orders, BOMP Orders, and Shop Floor Orders), are determined in the Available To Promise Setup screen. been setup in COP. The example below reflects the Customer/Item price code. The Price Break Screen function makes available other [F] keys, lower menu bar, for more effective customer service. These [F] keys are detailed below. 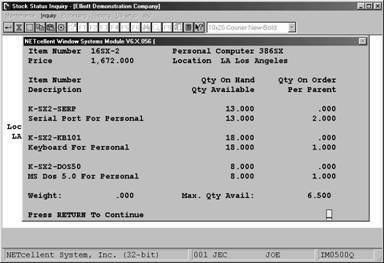 F1: View Invoice History for the item. This function key gives a complete listing of all invoices containing the item being inquired on. F2: View Customer Invoice History by Item. This function key gives a listing of all invoices, by item order, pertaining to the customer specified in the Stock Status Inquiry. F4: Create a Quote. If you confirm the quote, you can immediately enter it as a sales order type “O”, “I”. To create a COP sales order, please refer to our Sales Desk documentation. The function keys in Stock Status Inquiry – Enhanced View are powerful Customer Service functions and the user should thoroughly review these to understand how best to apply them to everyday applications.